I arranged for Sam Hughes to pick me up at my hotel in Deming around 8:00 the morning of the 25th. So that morning I woke up at 6:00 and finished packing my panniers. I had too much food and could not carry it all with me. Sam arrived an hour early, but I was ready to go. I gave him my spare oatmeal, poptarts, and some granola/Clif bars. It turns out a lot of Great Divide riders and CDT walkers overpack food at the beginning of the trip. Sam had quite a collection of Mountain House meals and camping food in his house. The ride from Deming to Antelope Wells took quite a while…even going 60 mph. By the time I arrived, it was almost 9:00 and the mercury was beginning to climb. At the border, I chatted briefly with the border guards. They offered me bear spray and stove fuel that riders had left behind. I guess its a good sign that bear spray can make it through long stretches of bearritory without being used. After some pictures, I was off and riding. 46 miles of sun, heat, and dust devils lay between me and Hachita. It was a very long, almost surreal, 46 miles. The scenery changed extremely slowly. I made it to Sam’s house without incident around 14:30. He welcomed me with a beer, which I gladly accepted. We sat in the shade of a swinging bench in his yard and chatted. There really wasn’t much else to do in Hachita. After dinner, we watched TV and talked some more. He told me of his wife, prospecting and treasure hunting, artifacts he had found, jewelry-making, and his time served (underage) in WWII. He also showed me the rifles he used, which I thought was very interesting. Those things were damn heavy. 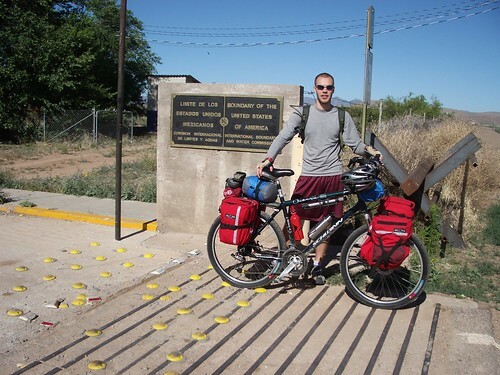 While we were talking, a future Great Divide rider called to arrange a ride from El Paso to Antelope Wells the next day. It was a girl who was doing the trip with her father. Its nice to know that there is someone a day or so behind us. Maybe we’ll run into each other down the road. As the sun set, I holed up in my tent and listened to coyotes howling in the distance. 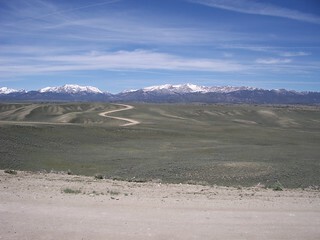 Tomorrow I will leave Hachita and ride toward Silver City.